Following another long night in a short series full of pain and ecstasy, heartbreak and triumph, sloppiness and gross feats of athleticism at the boundary of human ability, it was the defending World Series Champion Chicago Cubs that emerged from the melee, beaten but still beating. The Washington Nationals' hopes of emerging from the first round for the first time in team history, perhaps not so unpredictably, have once more collapsed into a smoking pile of ignominious October rubble. The postseason moves on with the Houston Astros hosting the New York Yankees tonight to begin the ALCS. RPScore sees the Cubs as significantly weaker than the rest of the playoff pack, and so my model assigns them the lowest probability of winning the World Series at approximately 6:1 odds, not even 40% underdogs against the Los Angeles Dodgers in the NLCS. The AL opponents are neck-and-neck, the Yankees chances slightly more favorable despite Houston's home turf advantage due to New York's higher rating. 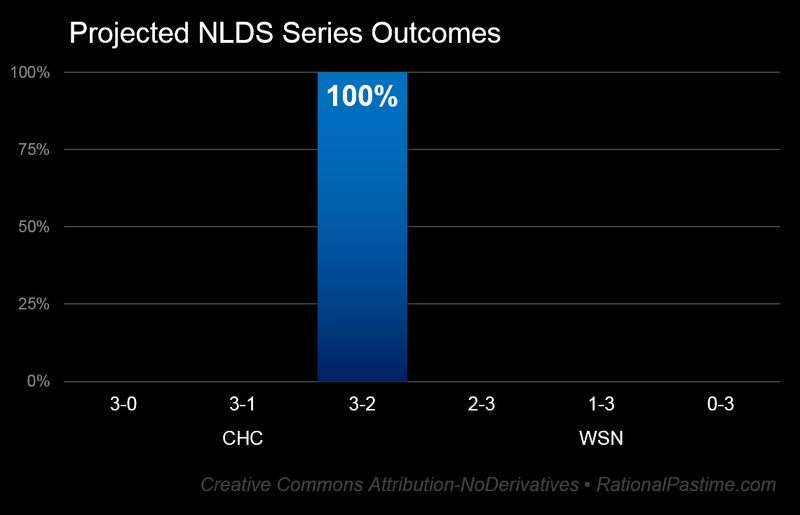 At 17%, a Cubs win in five games was the fourth most likely outcome out of six predicted at the start of the series. 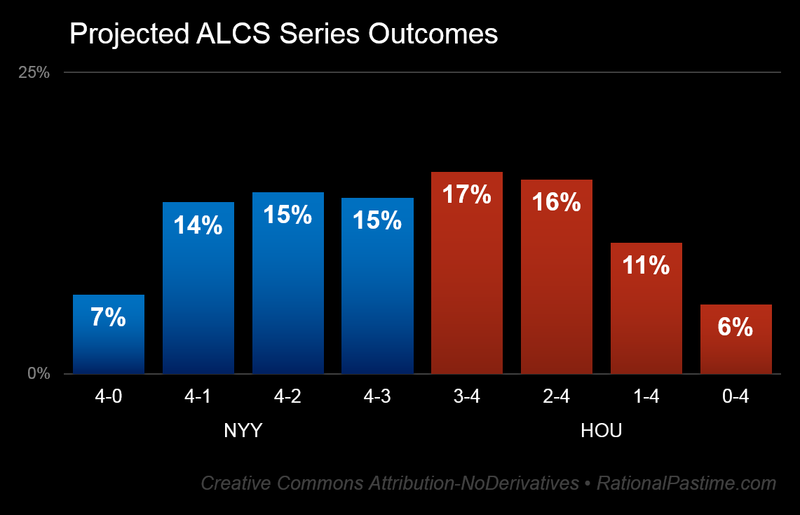 The two most likely discrete ALCS results are Houston victories in either six or seven games. However, my model picks the Yankees over Houston to grab their 41st pennant by the slightest of margins, 51-49%. 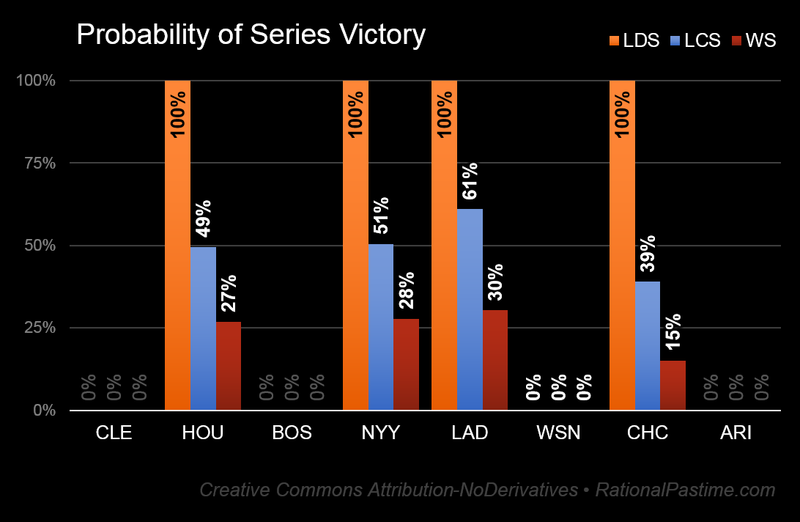 My simulations report that the Los Angeles Dodgers are clear favorites over the Chicago Cubs, thanks to their strong rating and their home field advantage. The most likely result is a Dodgers win in six games. The betting markets disagree with me heavily on two points. The bettors at Bovada feel that I'm seriously overestimating the Yankees by a whopping eight percentage points in terms of their World Series futures, while simultaneously underestimating the Cubs by 5%. We shall see. 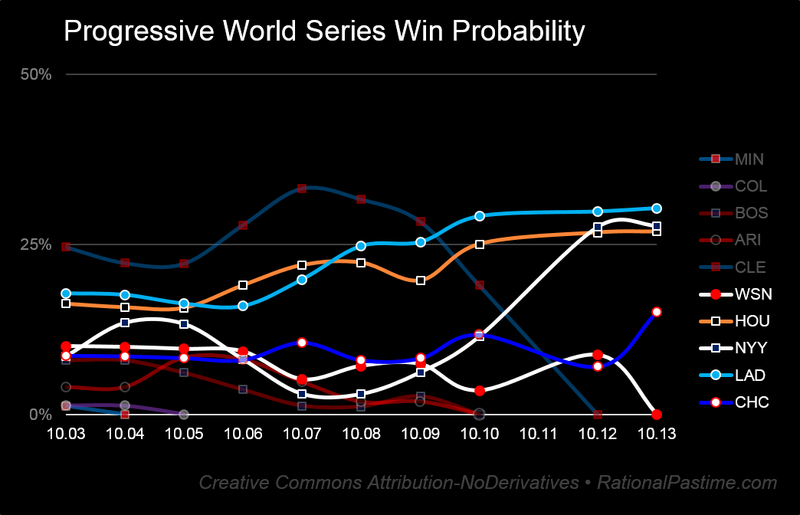 We're down to 32 possible discrete World Series outcomes from an initial tally of 200. The top four most likely results have the Dodgers beating either the Astros or the Yankees, with those possibilities representing a fifth of the entire probability distribution. We've now reached the point in the postseason where the result of each game not only affects the championship probability of the teams involved but also notably influences that of the teams in the other league. RPScore indicates that the Dodgers would much rather face the Astros than the Yankees, whereas the dictates of home field advantage in the World Series would soften the blow of taking on the higher-rated Yankees instead of Houston. 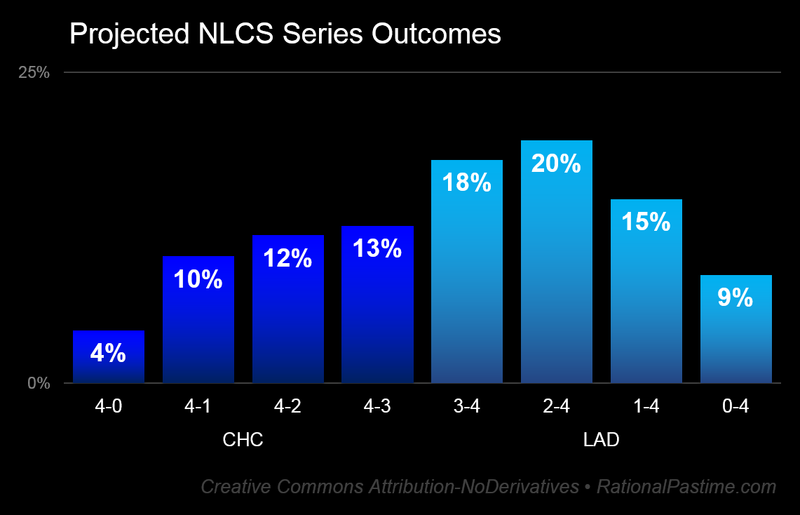 Check back tomorrow after game one of the 2017 American League Championship Series to see how the statistically modeled fates of the four remaining squads are influenced by the first game of the penultimate round.